The return of NFL football kicks into full gear this week and Sunday’s action begins with a game between the Detroit Lions and Indianapolis Colts. Preseason games are a time for teams to find out exactly who will be playing for them, whether it be specialists, rotational guys, or full time starters. Below, PFF’s team of analysts have all the most important position battles and players to watch during today’s game. With the injury to Taylor Decker the Lions have been desperate to find a viable replacement. The team immediately signed free-agent tackle Cyrus Kouandjio, traded for former second overall pick Greg Robinson, and have given UDFA signee Storm Norton first team reps at left tackle. Robinson has been penciled in as the starter since his arrival despite never living up to his billing as the second overall pick in 2014. So far, the highest grade of his career came in 2015 and was just 47.1 overall, ranking 67th out of qualifying tackles. Last season Robinson really struggled in the run game earning the second lowest run block grade among tackles at 35.0. Cyrus Kouandjio is the most likely candidate to steal the job from Robinson. Kouandjio has had much more success on the field so far earning the 34th best grade among tackles last season at 76.5, but perhaps seems to fit the system better on the right side. Storm Norton had a nice career at Toledo and earned the 44th highest grade among draft eligible offensive tackles at 83.9 but just went undrafted five months ago. The Lions were one of the worst defenses in terms of defending the slot last season. 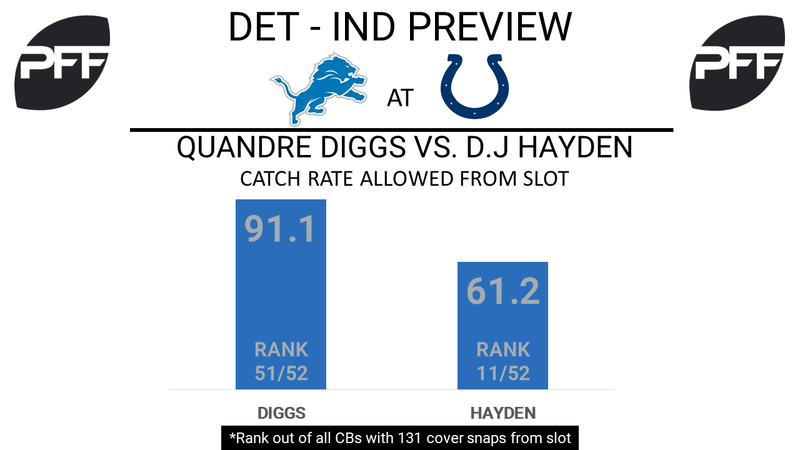 Incumbent starter Quandre Diggs gave up a catch rate of 91 percent from the slot in 2016, the second highest rate among cornerbacks that played in the slot for at least 130 snaps. He also surrendered the third highest passer rating against of 124.2 when defending the slot in 2016. DJ Hayden was given big money to come in and take the job despite being an under-performer himself. Hayden’s highest overall grade came in 2014 where he ranked 51st among qualifying cornerbacks earning a 57.6 overall grade. Comparatively Hayden has been much better than Diggs in the slot allowing a catch rate of 61.2 percent and a passer rating against of 93.9 in 2016. With Ziggy Ansah currently on the PUP, Kerry Hyder has assumed the right defensive end job leaving a spot open on the left side. The presumed front runner, Cornelius Washington came over this offseason as a free-agent from Chicago. In Chicago, Washington was seemingly missed-cast as an interior defender. His 2016 performance however had some bright spots. His overall grade of 70.7 ranked 66th among 125 qualifying defensive interior prospects. Washington was effective rushing the passer earning the third highest pass-rush productivity among qualifying 3-4 defensive ends at 9.9. Washington was especially effective on third downs earning the fourth highest pass-rush productivity among all interior defenders at 12.0 (min 100 third down pass rush snaps). Zettel had a rough rookie season in 2016 playing just 224 total snaps and earning an overall grade of 50.0. When given the opportunity to rush the passer he didn’t fare well producing a pass-rush productivity of just 4.7. He registered just six total pressures on 101 pass rush snaps. Antonio Morrison and Jon Bostic have received the majority of first-team snaps during training camp, and were listed as starters on the team’s initial preseason depth chart. Morrison was Indianapolis’ most efficient run defender in 2016 (his 9.0 run stop percentage ranked 23rd at his position) but struggled in pass coverage. Opposing quarterbacks earned a 141.3 passer rating when targeting the rookie (highest among linebackers). Bostic’s starting status comes as a surprise, as the former Bears second-round pick has played just 41 defensive snaps over the last two seasons. Sean Spence, a 2017 free agent addition, earned the highest overall 2016 grade in this competition (70.5), but has struggled in camp thus far. 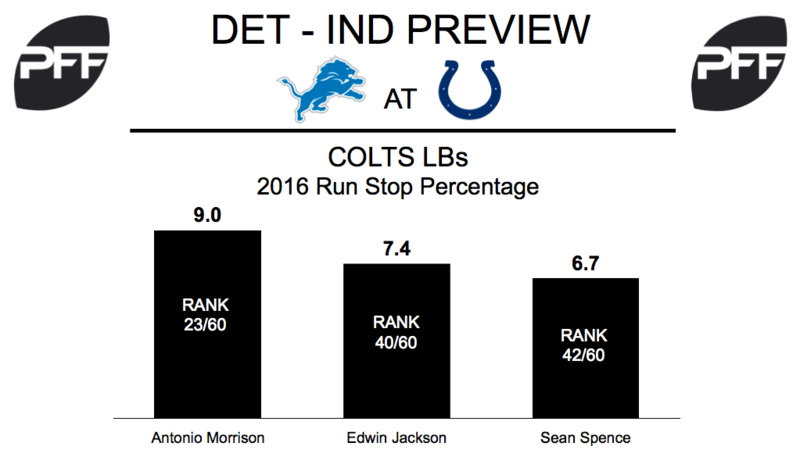 Edwin Jackson started seven games last year, accumulating 15 stops in 202 run defense snaps. Rookie fifth-round selection Anthony Walker will also see significant snaps tonight in his first NFL action. T.Y. Hilton and Donte Moncrief are the clear-cut starters at wide receiver, but there is competition for snaps behind the duo. Chester Rogers appears to have a leg up heading into the Colts’ first preseason game, but the 2016 UDFA did not have an efficient rookie year. The wideout averaged 0.96 yards per route run while catching 19 of 31 targets (no touchdowns, two interceptions thrown when targeted). Rogers’ main competition will come from former first-round pick Phillip Dorsett. The former Miami Hurricane has struggled with injuries and inconsistency in his two seasons. 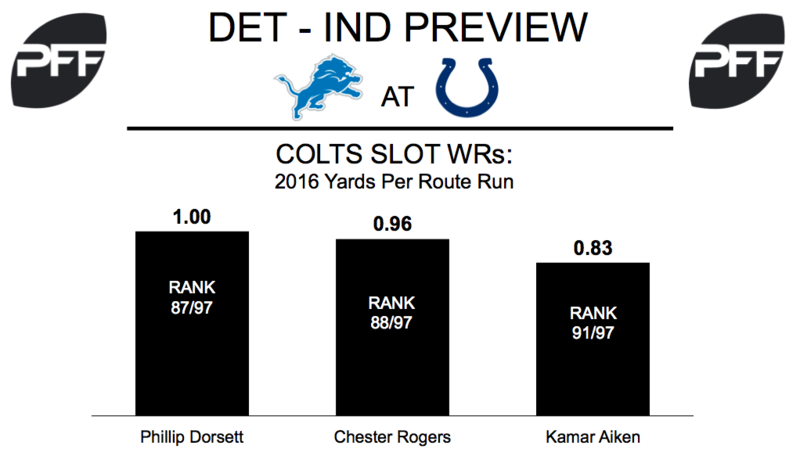 Dorsett averaged 1.00 yards per route run in 2016, failing to make an impact as a boundary wideout. Indianapolis signed Kamar Aiken in March after a rough final season in Baltimore, but the veteran could open the year as the team’s fifth receiver if not for a preseason impact. Expectations were high for Wilson when the Colts drafted him in the first round this year, but the Florida Gator has received limited first-team reps in camp thus far. Opposing quarterbacks had a measly 29.9 passer rating when targeting the cornerback last season. He will look to begin a climb up the depth chart in his first NFL game. The mountainous offensive lineman will also be making his NFL debut, attempting to earn a swing tackle role or perhaps the starting right tackle position this summer. Banner allowed just 11 total QB pressures on 442 pass blocking snaps last season for the Trojans.